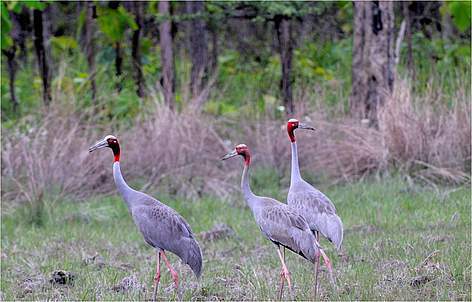 Sarus crane, the tallest flying bird in the world, is suspected to breed in Mondulkiri Protected Forest within Cambodia's Eastern Plains Landscape. Cambodia large variety of habitats both on land and in water are home to a significant diversity of threatened wildlife species. Among mammals, wild cattle and deer species as well as predators like tiger and leopard still roam the remote forests of the Eastern Plains Landscape, while a small population of Irrawaddy Dolphin inhabits the Cambodian section of the Mekong River. Birds are equally plentiful - especially Cambodia's populations of large waterbirds in both forests and wetlands stand out as globally significant. The Mekong River is also home to several endangered and iconic fish and reptile species, and critically endangered Siamese crocodile have been observed in the Eastern Plains' Srepok River.